Hello everyone, this is Robin from Robin's Creative Cottage to share another lovely shape card with you here at My Craft Spot. This flower pot is cut from the Freshly Picked Cricut Cartridge, from page 33 of the handbook and measures approx. 4 1/4" tall and 4 1/2" wide. 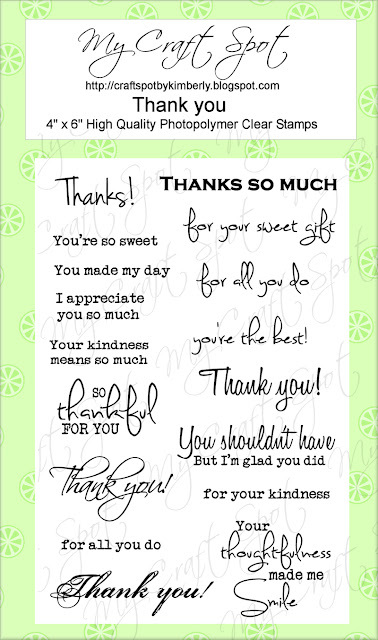 I've used Kimberly's new"Thank You" stamp setfor the two sentiments and love how they've added a beautiful touch with the two different fonts styles. The bow was tied using the Vanilla Bean Crinkle Ribbon. 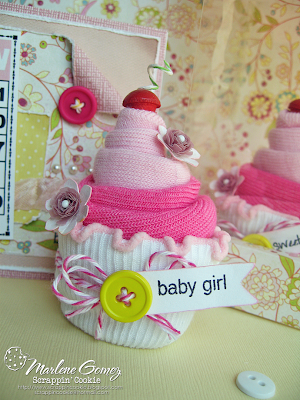 Both the stamp set and ribbon can be purchased -HERE in the My Craft Spot Shop. Monday Challenge #64 - Oh, Baby! Hello, my crafty friends! Are you ready for another fun challenge?! This weeks Challenge: Oh, Baby! Now it's time for some inspiration from my fabulous design team! I love the soft colors on Gwen's beautiful card! The giraffe is so sweet - love the button! GiGi's card is sooo cute! I love how each square has a fun element! The double bow is so fun! What a fun gift set! I love Marlene's cute cupcakes! 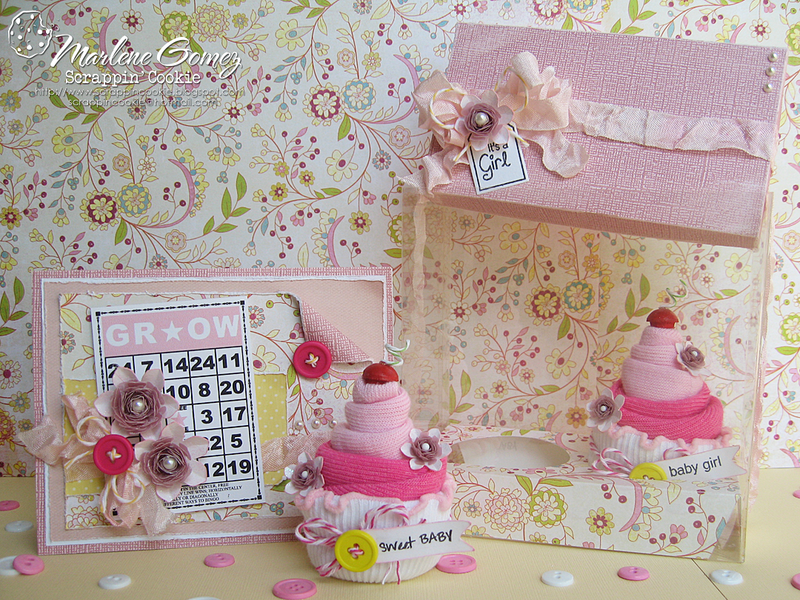 The fun flowers, buttons, twine and layers on Marlene's card are beautiful! DT post by Gwen - Oh Happy Day! Hi this is Gwen here and I have a fun little card to share with you today. I made this card for my little grandson Tyler who just turned 2. He is a sweet little boy and definitely a Grandma's boy, don't believe me, just ask him. 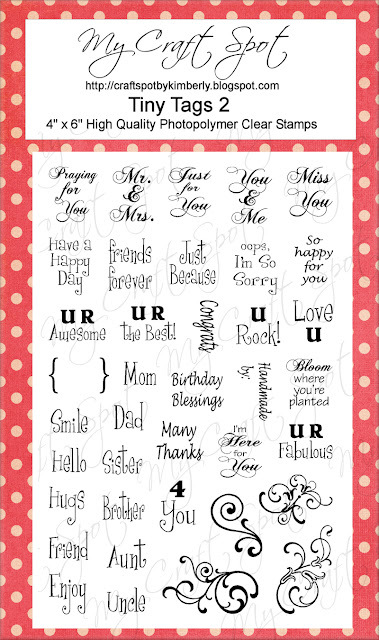 This idea came from the Cricut Magazine Birthdays, it was made by Roree Rumph. She made it as a tag, so I changed it up a bit and made it a card. bear and wagon and all layers cut at 5"
This never happens, but the stars were aligned just right for me today. I had the same (except for the bear) papers and stickers she used and I didn't even go to the store, love that. Check out my blog here. It's Flashback Friday time again! I posted this tutorial almost a year ago and this is still one of my favorite style flowers to make! It looks just as pretty using patterned paper with a solid color center. This is my favorite flower from the Flower Shoppe cartridge! DT post by Kate - 'tis the season to be Jolly! Hello Friends! Welcome to My Craft Spot! I'm Kate from Small Bits of Paper here to share a sweet little card with you. 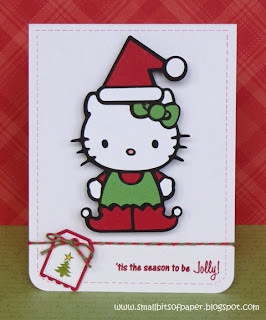 This week's challenge at My Craft Spot is Christmas in July. I thought I'd give you a bit more inspiration as you get a head start on your Christmas projects! I used Hello Kitty Greetings to cut the little image and attached it with an Action Wobble. The card sentiment and little tree stamp on the tag are both from My Craft Spot's 'Tis the Season stamp set. 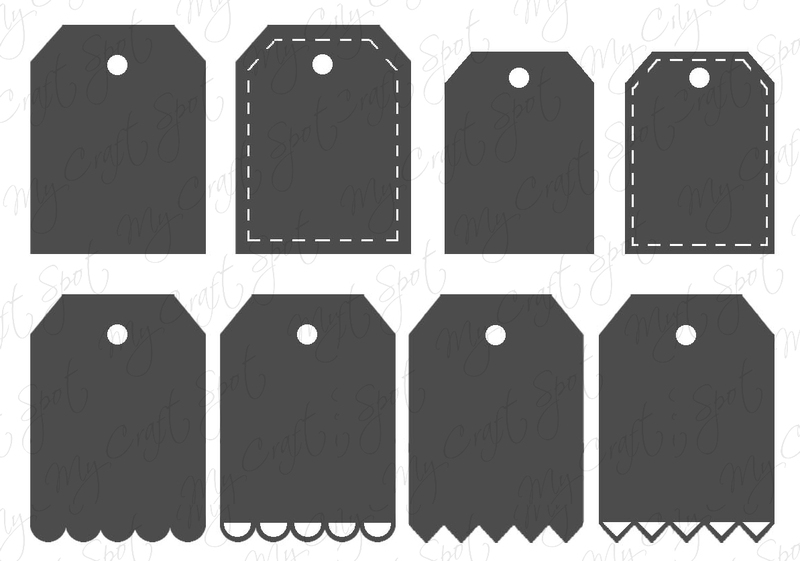 The little tags were cut using My Craft Spot's new Tiny Tags Metal Dies. I just LOVE these dies! Although they are made to coordinate with the Tiny Tags stamp sets, you can use them with other stamps or cuts as well - just like I did! I used some fun Holly Berry baker's twine to attach the layered tag to my card. There is still time to play in this week's Christmas in July challenge. Click HERE for details! Hello crafty friends, this is Robin from Robin's Creative Cottage here to share another fun card with you. This is your basic A2 size card (4 1/4" x 5 1/2"). I've used a cute girl image from Tiddly inks digital stamps, the background pattern paper also has a suitcase digital image printed on it. See those tiny yellow brads in the bottom left corner, I stamped the flower on them using black stazon ink.... so cute! The tiny flower stamp is from Kimberly's "Butterfly Kisses" stamp set. I've used the Tiny Tags 2 stamp set with the coordinating Tiny Tags metal die for my sentiment, love this stamp set and die! The crinkle ribbon is Spring Moss, the traditional twine is Chocolate. All of which can be purchased on this blog -HERE. I have more photos and details on my blog, so please come visit me at Robin's Creative Cottage. DT post by Robin - We're Tickled Pink! Hello friends, this is Robin from Robin's Creative Cottage, I so happy to share a sweet project with you today here on My Craft Spot. One of my friends will be having her first baby any day now and it will be a girl! My daughter and I made a no sew fleece tie blanket for her, it's pink with adorable turtles on it, so couldn't help making a cute turtle shape card to match. Did you ever think a turtle could be so adorable? The crinkle ribbon is Spring Breeze and the cute sentiment is from Kimberly's "New Arrival" Stamp Set, the sentiment on the inside of the card is also from the same stamp set, such a great stamp set for babies! 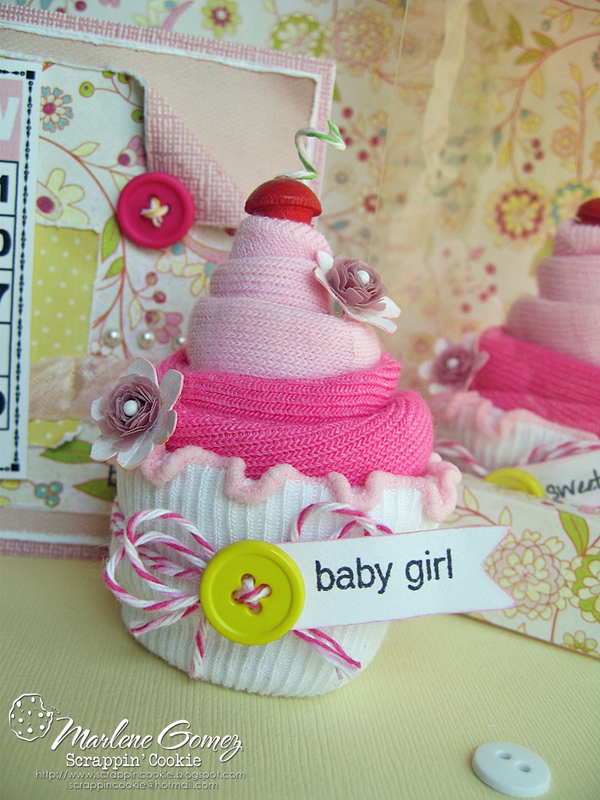 Both the crinkle ribbon and the New Arrival stamp set can be purchased here on My Craft Spot. I've cut the turtle from the Create a Critter Cricut cartridge at 3" tall, using my gypsy I welded two turtles together for the shape card. The face stamp is a sweet Peachy Keen stamp Critter faces medium size. Added a wild Orchid Crafts rose and attached a tiny little safety pin with three tiny beads to the ribbon. I always enjoy visiting here at My Craft Spot. Have a wonderfully creative day! Monday Challenge #63 - Christmas in July! 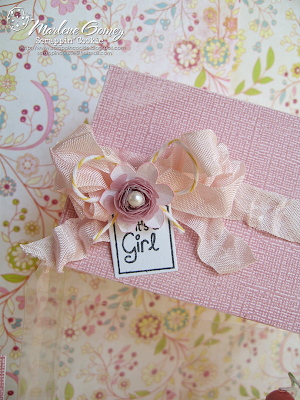 GiGi's little gift box is so sweet! I love the cute snowman face hiding in the bow - adorable! The patterned papers GiGi chose are awesome! I especially love the paper bow she made! Heather's card is sooo pretty! I love the vintage colors! Heather's digi is so pretty! Love the shading and inking! What fun treats! All of the different patterned papers Robin used look so pretty together! 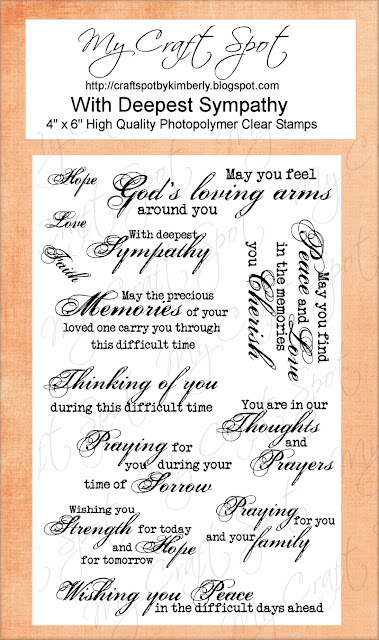 I love how Robin embossed her sentiments - so pretty! DT Post by GiGi - UR Fabulous! Hello everyone! This is GiGi from The Cricut Bug posting today here at My Craft Spot. 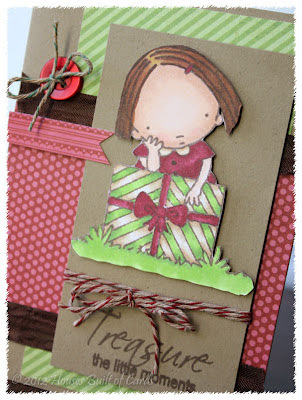 I have a really cool card to show you that I made with the new Tiny Tags 2 stamp set and matching Tiny Tags Dies. I used some Hot Pink Crinkle Ribbon for the laces! How cute is that!?!?! AND I used some fun Divine Valentine Twist twine too! I cut the shoe from Slumber Party and dressed it up a bit. I added Glossy Accents to the bumper and heart. I decided I wanted shoe laces so I did this by punching holes in the shoe, added black eyelets, and then laced some Hot Pink Crinkle Ribbon. I used the Tiny Tags Dies for the tag and stamped the sentiment which is from Tiny Tags 2. I added it to the mat using a brad and also added punched border strips to the sides of my card. To finish I added some Divine Valentine Twine around the side of the card and tied a bow. Thanks for stopping in today and if you would like to see more info on this card, please visit me at The Cricut Bug. Have a great day! Welcome to another Flashback Friday! I love pillow boxes because they are so fast and easy, yet they look fabulous! I cut the pillow box at 9 inches from the Wrap it up cartridge. I used Black Diamond Crinkle Ribbon to tie this double bow (see video for tutorial). DT post by Amber - Piggy Birthday Party! Hello! This is Amber from My 3 E Scrapbooking posting today at My Craft Spot. Today I have a cute little shape card made for a Piggy Birthday Party! I used my Gypsy and Create A Critter to cut this darling little piggy! I added a little flag and the "Happy Birthday" sentiment from My Craft Spot's Inside & Out - Set #2 stamp set as well as a little birthday hat trimmed in My Craft Spot's Candied Orange Crinkle Ribbon and Orange Divine Twine. I even added a little curly tail to the back made with Cotton Candy Divine Twine! I would love for you to stop by my blog My 3 E Scrapbooking for more details and pictures! Be sure to visit here again tomorrow for another fun Flashback Friday! Thanks for stopping by! DT post by Kate - Congrats graduate! Welcome visitors to My Craft Spot! I'm Kate from Small Bits of Paper and I'm delighted to share a project with you today. 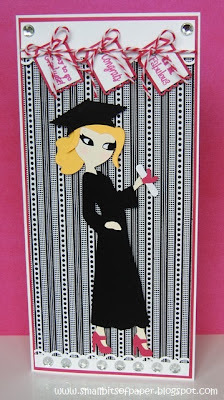 My daughter recently graduated from high school and I made this card for my husband and I to give her to let her know how very proud we are of her. Although Erin's school colours are green and gold, Erin wore hot pink to prom and so I decided to go with that colour instead. It's more bright and celebratory! 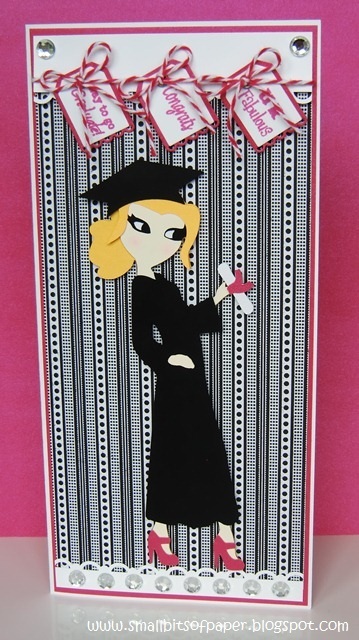 The graduate was cut from Paper Dolls Teen Scene at 6 inches. I then used a Stampin' Up punch for the borders at the top and bottom of the card. 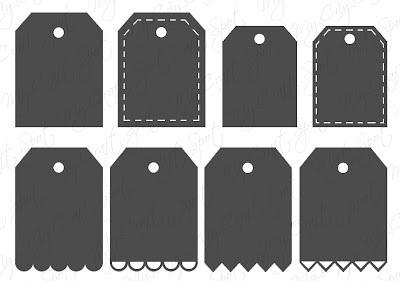 I cut the little tags and shadows for my banner using the new Tiny Tags dies and stamped them using sentiments from both Tiny Tags and Tiny Tags 2. I just LOVE these little stamps and dies!! I used some fun Pink Sorbet baker's twine to string my banner - and tied some little bows for each tag too. I finished things off with some bling, using some large gems to create some sparkle on my card. Thanks so much for coming to My Craft Spot today! Don't forget to come back tomorrow to check out Amber's fabulous project! Thanks for celebrating with us this last week! We had so much fun playing with the new stamps and metal dies and then sharing all of our creations with you. Thank you for all of your sweet comments! So, you probably want to know who won all of the fun prizes from last week . . .
Becky said: That twine is yummy! And those tiny tag dies are adorable! LOVED the DT projects...so much talent! Kristan said: Very pretty card, i love the window in it!! Dt did another great job!! Craftin Divas said: Love the all the cards!! Great stamp set. 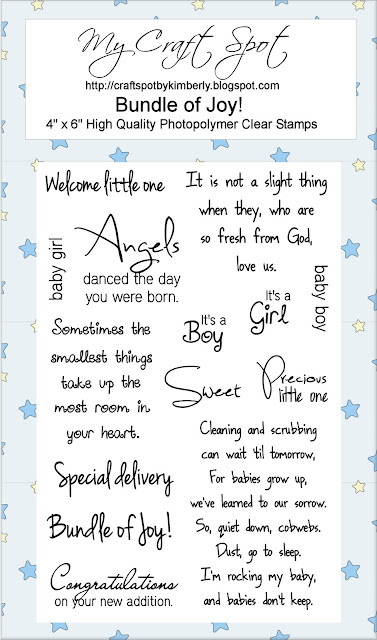 Jessica said: Oh my I love these baby cards!!! Those stamps are PERFECT! I love the pre stamped 'name, length, weight'! Super projects ladies!!! Saturday Blog Hop - (Bundle of Joy stamp set) - #68 Sheri R.
Click HERE to see all of the new stamp sets and metal dies. I cut the train and all of its layer at 3 inches from the Nate's ABC's cartridge. I cut two of the background layers from cream cardstock, scored the top of one and glued together to form the card base. I stamped the sentiment after adding the plaid patterned piece so it would be easy to line it up with the window. I inked all of the edges with brown ink and added a little glitter on the top pieces. I thought the wheels looked a little plain, so I added buttons, crochet thread and a pearl to each. The patterned paper is MME and the cream paper is a smooth paper from Bazzill. Here are all of the new stamp sets and metal dies! Now go see all of the awesome projects my Design Team members have created! Remember to leave a comment at each stop. Each one has one of the new stamp sets to give away! 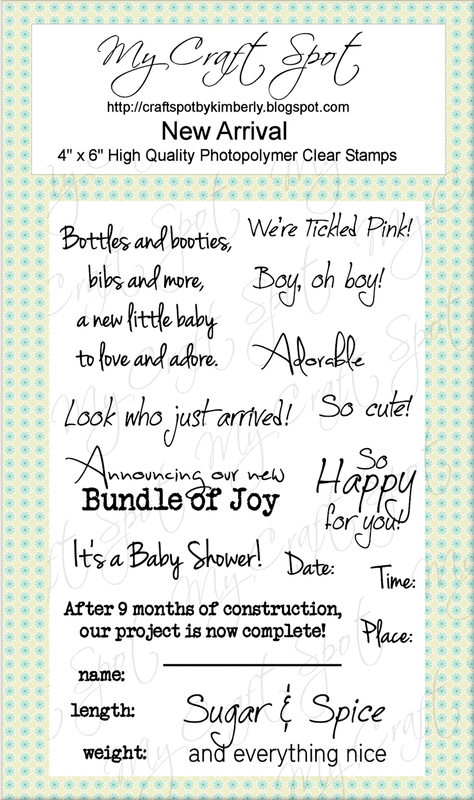 I am giving away the Bundle of Joy Stamp Set! Sneak Peek Day #2 - Thank You Stamp Set! DT Post by Gwen - Bang! Flashback Friday - Floating Window Cards! DT post by GiGi - You're so sweet!